My Best Bird of the Weekend was Red-breasted Nuthatch, many of which were emboldened to visit my feeder in the midst of mountains of snow. 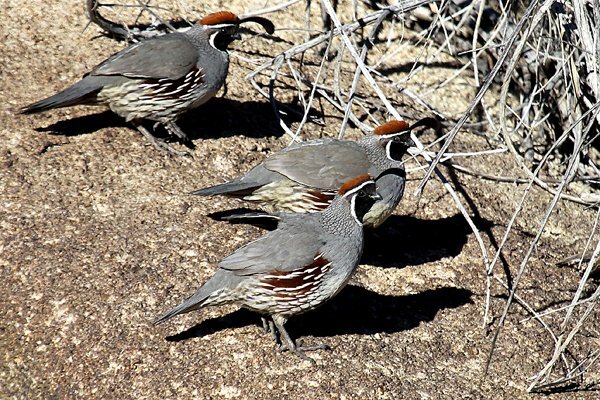 Corey’s BBOTW was a large covey of Gambel’s Quail at Joshua Tree National Park on Friday. Flock of 25 Common Redpolls have invaded my back yard. Amazed at the differences in their appearance. Definitely the razorbills at St. Marks NWR, Wakulla County Florida! Long-tailed Ducks, a whole bunch of them just a few yards offshore from my city’s most-loved lakeside park. They are really common on Lake Ontario in the winter but they are so cool. The males look like they’re ready for a fancy New Years party and plan to leave their Cinderella mates at home to sweep the hearth. Life Ross’s Goose! I wasn’t sure in the field whether it was Ross’s or Snow, but I snapped some photos and had some fun debating the ID on Facebook and Twitter. A lively Red-breasted Sapsucker on Indian Island here on the Olympic Peninsula. Definitely the bald eagle I spotted, first directly outside my building, then across False Creek. I saw it again, today, circling high in the sky. Unfortunately, I’ve yet to get close enough to it to get a decent photograph. The one time I was within shouting distance, I didn’t have my camera. I swear, I’m never going outside without it, again! Every time I venture out camera-less, I spot something I wish I could’ve snapped. I saw five Rusty Blackbirds while doing a Christmas Bird Count on Sunday. Rusty Blackbirds have become very hard to find in recent years and that particular count is not one where I normally see blackbirds of any species so they were a real surprise.